As my resolution – to keep this blog more regularly – started on 1st January, I wasn’t going to make an entry for the “Windows & Death” Ride on 29th December. My route, from Euston to the start at Hyde Park Corner, on to All Bar One at Shad Thames, and back to Euston, is here. Many thanks to Simon and all my Fridays friends (aka Friday Night Ride to the Coast aka FNRttC) although, like the Holy Roman Empire, this was neither on a Friday nor at night-time nor to the coast. 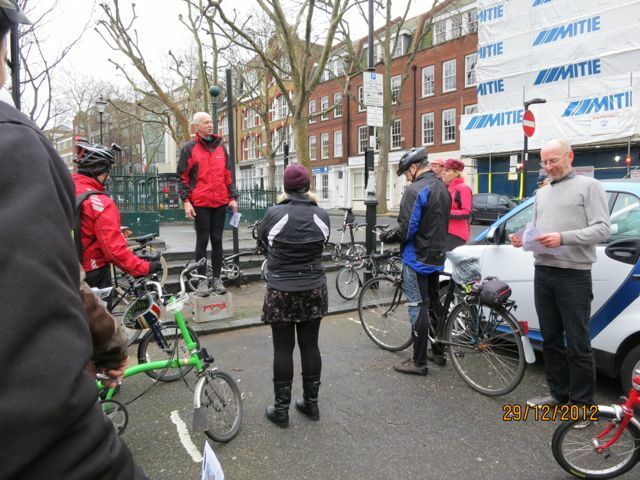 This entry was posted in Cycling, The Fridays and tagged Bikes & Bees, Clerkenwell Green, FNRttC, Hyde Park Corner, Lenin, London, SwarmCatcher, The Fridays, Windows & Death by ianmac55. Bookmark the permalink.